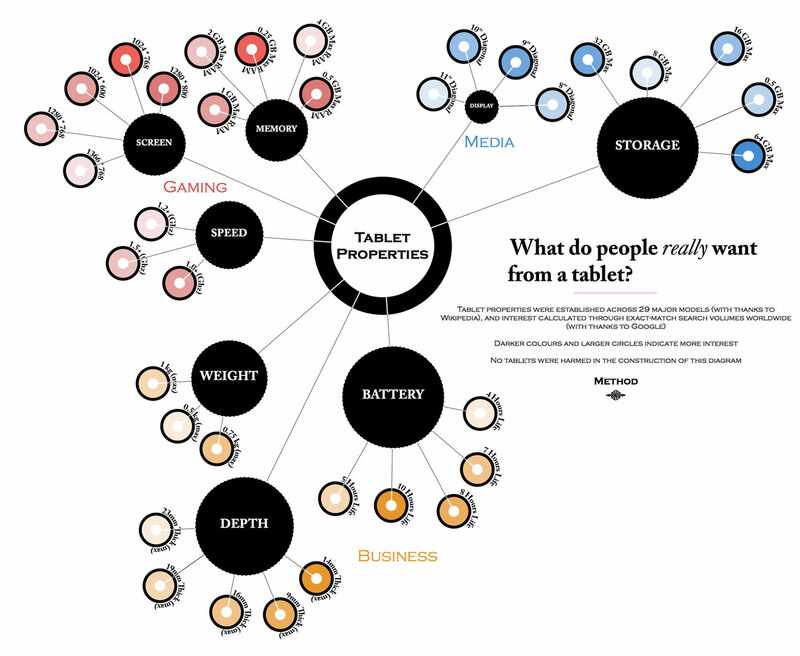 Infographic Of The Day: What Do People Want From A Tablet Computer? The typical way to figure out what consumers want is to go out and do a survey. Or stay in and conduct focus groups. But Method, the design and branding agency, set out to do something a bit more interested when Dell commissioned them to research the tablet market. Instead of a survey, they mined Google to figure out what people were searching for. Now, regular readers of this blog will note that we’re generally quite suspicious of consumer research as a meaningful guide to product development–as the great Steve Jobs said, “It’s not the consumer’s job to know what they want.” You’ll never discover an idea for a new product that people will love–whether its an iPhone or an iPad–by simply asking them. Product development is more about prediction than it is about reaction. But I find this chart most interesting because it suggests that infographics could aid the product refinement process. Imagine if, instead of doing market research, you mapped a bunch of searches that people did around focused themes such as “user interface” or “touchscreen.” And imagine if you were able to take that data and produce a mind-map of the things people care about. Using that, you really might be able to at least get a sense about where the debate around a subject has settled–and find little opportunities hidden in the corners that are ripe for disruption. You might find a map of their worries and irritations, which is a good place to start when looking to create a new product. But back to this chart at hand. The most interesting thing about the tablet debate here is that people don’t seem to care much about speed, screen size, or even memory. This would have been unfathomable 10 years ago with any gadget: The chief sales pitches always revolved around tech specs. Instead, you now get searches about physical dimensions and battery life–in other words, people are more concerned with what it’s actually like to live with an object and use it. Bubbling in the background, of course, is the fact that the tablet market is dominated by iPad–and surveys have shown that people don’t want tablets as much as they want the hottest new Apple gadget. Take that as a double testament to Steve Jobs’s impact: People don’t care about tech specs. They care instead about the design and polish of a gadget–that magic touch that gives it soul, just like Steve Jobs was always championing.